You just bought a beautiful oriental rug, and rather than showing it off with pride, you’re covering it up to keep it from getting ruined! Sound familiar? 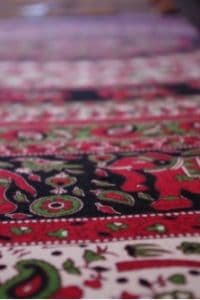 Oriental rugs may be delicate (and dazzling! ), but don’t worry. There are many simple ways to clean and preserve your rugs so you can actually get some use out of them! A1 Sparkles has the tips and tricks for properly maintaining your rugs. We are a natural cleaning company in Bridgeport, PA who has built a reputation for providing high quality cleaning services to our clients. We know rugs like the backs of our hands! Block sunlight – Direct sunlight can cause the dye in your rug to fade over time. Keep sunlight from hitting the rug to help keep those beautiful colors intact. Rotate regularly – Some say you only need to rotate your rug every two years, but we’d recommend every month or two if it’s in a high traffic area of your house. This will help keep it looking uniform – not worn in only one area. You can also move your furniture around every six months. Flip it – Don’t try and comb out any fringes at the end of the rug because they are delicate and can tangle or get damaged. Instead, flip one end of the rug over to the other so the fringes can straighten out naturally. Vacuum – Vacuuming prevents the natural fibers of the rug from becoming packed down, so try and vacuum your oriental rugs a little more often than your carpets. Use padding – Putting a pad underneath the rug helps protect the shape, reduce wrinkling, and stabilize the rug. Air it out – Don’t let moisture get trapped in your rug, otherwise mold and mildew will form! Hang-dry your rug every six months. Wipe it down – If you aren’t keen on beating your rug, you can wipe down the surface with a cold, damp cloth to help remove surface dust. Get it professionally cleaned – The best way to keep your oriental rug healthy is to get it professionally cleaned on a regular basis. A1 Sparkles uses the safest cleaning products to keep your rug in mint condition! We recommend getting this done every 12-18 months. Keep Your Rug Gorgeous All Year Long with A1 Sparkles! If it’s been years since you’ve had your oriental rugs professionally cleaned, it’s time to give A1 Sparkles a call! We offer our unbeatable cleaning services in Montgomery County, PA area including Norristown, King of Prussia, Blue Bell, and surrounding areas. Call us today at 610-292-9069 to get an expert cleaning service for your area rugs.